Last year, Washington State QB Connor Halliday set an NCAA record by attempting 89 passes against Oregon, a game I attended. 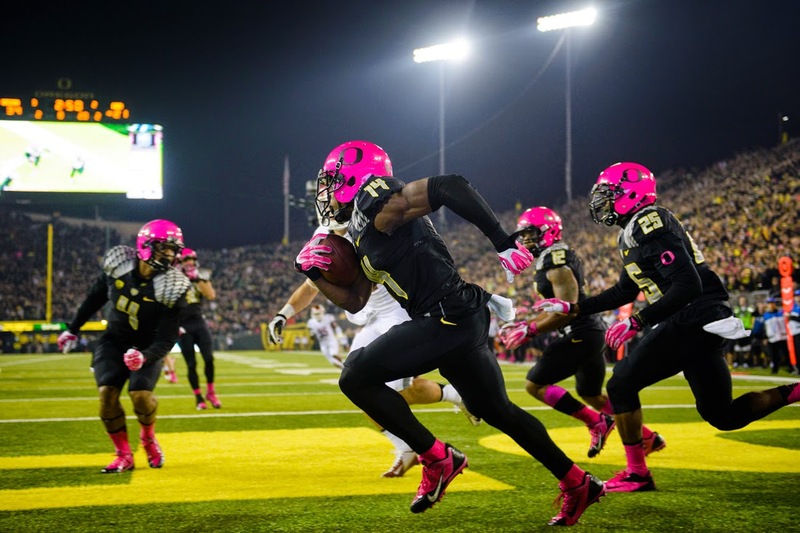 Oregon wore pink breast cancer awareness helmets, so it's easy to pick that game out during the highlight montages. In my Pac-12 preview for BayAreaSportsGuy.com I noted that I expected Halliday to break 100 attempts at some point this season. It may well happen this weekend in Pullman against the Ducks in the conference opener for both teams (Saturday, 7:30 pm PT, ESPN). Halliday has thrown for more than 500 yards twice this season already. His 1465 yards lead the country (but only by six yards over Brandon Doughty at Western Kentucky. What are the Hilltoppers up to?? Interestingly, they play Navy, who leads the country in rushing at 403 yards a game, Saturday at 12:30 PT on the CBS Sports Network. A study in contrasting styles, indeed). He has more completions (119) than all but 14 quarterbacks have attempts. In all three of Wazzu's games this year, he's thrown at least 55 times. Contrast that to Oregon Heisman Candidate Marcus Mariota, who has 50 completions. On the year. Not surprisingly, Wazzu doesn't run the ball very much. Last year in the stands, people were complaining that the Cougs were continuing to throw the ball when the game was late in the 4th and the game was clearly decided. The answer was “They don't have any running plays!” And while that may not be completely true.... they have to have at least a couple.... I mean, probably... it is certainly not a focus of preparation for the Mad Pirate, Mike Leach, and company. They have a total of 120 rushing yards. As a team. In three games. Four guys on Oregon have more than that individually, including Super Mariota (156). As dominating as Oregon has been- seven straight wins against the Cougs, an average score of 52.4 to 20.3, this game is in the Palouse, as the Ducks travel there for the first time since 2010. I remember that game for a few reasons. One, the game happened during Oregon's magical perfect season and run to the BCS title game. The Ducks were #2 in the country, and the game in Pullman was not originally scheduled to be broadcast live to Eugene- you know, where the University of Oregon is. The kickoff time was set during a time when ESPN and Fox, the Pac-10's broadcast partners at the time, had exclusive live broadcast rights on Saturday afternoon, and only at the last minute allowed the game to be televised live- to the state of Oregon only. I did a little searching and found a Vanderbilt non-conference game that was televised live on ESPNU that same day to the entire country because of the SEC's teevee contract with ESPN- but a game involving #2 Oregon was going to be on tape-delay. This convinced me that the Pac-10 had the worst teevee contact in the history of college football. I continue to believe that game was a major factor in the Pac-12 getting its own network (even if anybody who has DirecTV can't see it). The other thing I remember about that game are the injuries. It seems like every major Oregon player went down that day. 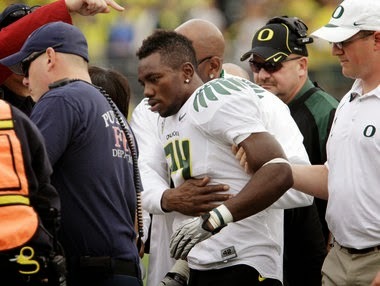 Many Oregon fans will probably recall Kenjon Barner getting blown up on a kick return and being carted off the field. QB Darron Thomas went out with a right shoulder injury (that was the beginning of the end of his Oregon career, I believe). Even defensive stalwart Casey Matthews got hurt, but he stayed in. Pullman was very dangerous for the Ducks that time around. But they won by 20 and the perfect regular season stayed intact. It's not a question of if the Ducks will win this game, barring major injury even worse than what happened in 2010. The question is whether Connor Halliday will attempt 100 passes. I say if it's going to happen, it'll happen Saturday. 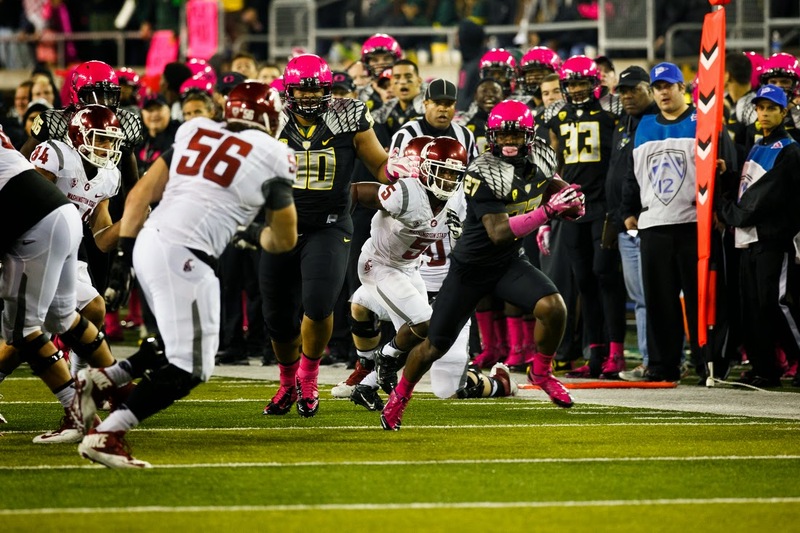 At least we'll be able to see it happen, even if Oregon isn't wearing pink helmets.